Monday January 19th marks Martin Luther King Day 2015. There is a moment towards the end of The Scottsboro Boys musical when a black woman is told to move to the the back of a segregated bus and she refuses. That woman was Rosa Parks and her subsequent arrest led to a boycott of the buses in her city of Montgomery, Alabama. King's role in the bus boycott was to transform him into a national figure and become the best-known spokesman of America's growing civil rights movement. John Kander, together with the late Fred Ebb, in creating the legendary partnership of Kander and Ebb had already composed some of the greatest shows of the 20th century, including Cabaret and Chicago before going on to write The Scottsboro Boys. 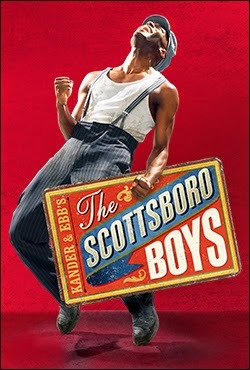 JB: What made you want to write a musical about the story of The Scottsboro Boys? JK: The first thing that happened really was that Stro (Susan Stroman – the show’s director and choreographer) and Fred (Ebb) and Tommy (David Thompson, who wrote the show’s book) and I loved working together. That's really the first thing. We were looking for a subject and we had spent some time dealing with the '30s as a period which to explore and as I recall, we thought let's keep looking there and see what's interesting to us. I can't be very accurate about how the subject came to us. Certainly we were looking at cases and trials among a lot of other things as a possible subject. I remembered that when I was just learning to read I would see on the newspaper, pretty much daily in those early reading days, something about The Scottsboro Boys. I didn't know what that was or who they were, but they were always mentioned, they were always called that title. As I began to be able to read and understand more, it seemed to me that they were always spoken of as a group. Then they disappeared altogether. When we stumbled on this topic we were immediately, in the first place just as humans, intrigued by this story and horrified by it. I think the thing particularly, looking back on it, was to think that these guys actually disappeared. There were nine lives that were just erased, if you will.Then we began to try and figure out how we might tell the story. JB: Yes. That show was broadcast on the BBC until 1978 and achieved very high ratings. JK: And the minstrel genre was terribly, terribly popular in the USA too. Nobody thought anything about it. That's what's amazing. I don't think any of us really thought about the real implications of it. Not only was it made up of white people in black face (black make up), but if you had black performers, they also had to wear black face too. Aside from the racist conversations that come with the minstrel show, its structural form was such that there is a semi-circle of entertainers and in the middle is sat a white man, the Interlocutor, who we looked on as a kind of benign “plantation owner” type. The Interlocutor calls on people to tell stories or tell jokes or do a dance or carry out some long sort of narrative and as you may recall having seen the show, every once in a while the Interlocutor will say, "Mr. Bones, tell us a joke." Or "You boys sing that song about home that I love so much." So that flexibility meant that we could jump around in the story and weren’t too bound by narrative. In my opinion, once we stumbled on the minstrel show, that was the key to The Scottsboro Boys musical. One of the other things about the minstrel show, which none of us really considered as we were growing up, was that it was a show populated by white men pretending to be black and playing for a white audience. They also sang songs written by white men as if they were black men longing for the days of the old plantation. Some of the most popular songs that ever happened in our country, the Stephen Foster songs like Old Black Joe or Swanee River, they all are very lyrical, nostalgic songs about “how I wish I was back on the old plantation with good ole Massa”. It's interesting, and I think this is so true in a lot more areas, that you can get used to that prejudice and you no longer think about what these things really mean. They just become kind of entertaining cliches. JK: Right, they did this in vaudeville for years and if you leave the black situation by itself, the stingy Jew, the drunk Irishman, those stereotypes are very entertaining to a certain extent and people made their careers out of exploiting them and being funny with them, but then in some areas they become lethal. When you look at the cartoons in the early days of Nazi Germany, the big-nosed, conniving Jew who is out to eat children and hoard all the money. Those things go from entertainment into real powerful propaganda. It happens without us even realizing it. JB: I want to talk more about the Interlocutor and what Julian Glover does with that role in London. JB: It strikes me as such a complicated role. The Interlocutor’s racism is ingrained, it's what he's grown up with. His is such a complicated character and I think Julian gives it an amazing degree of depth. JK: I quite agree. I think he's spot on with it and the thing is about the Interlocutor, is that he's a racist sort of by definition but he really, truly believes that black people are just not as smart as white people and it's up to the white folks to take care of them. He believes that that's what he does. He believes that they have a place in the world, but they are not equal to white folk, in a kind of paternalistic way. It's the romanticized idea of “good ole Massa” on the plantation, but he is not a Klu Klux Klansman. somebody who would go out and shoot people or lynch them. Julian Glover is perfect and he found just the right tone, so that at the end when the people that he's working with wipe off their blackface makeup and don't want to do the cakewalk anymore, he's upset that he's shocked and uncomprehending. JB: My next question is about the role of The Woman in The Scottsboro Boys. When I first saw the show, the woman was an enigma to me throughout, until the Rosa Park connection is made at the end. Seeing the show again and watching her onstage throughout, one can really observe that she symbolizes what The Scottsboro Boys did to the civil rights cause in the United States. Whose idea was it, as you were creating the show, to have the woman onstage throughout? JK: I can be very specific about that. Tommy and Stro and I were having lunch at Stro's house, which is something we like to do anyway and we were sitting around the table and in my memory it was Stro who brought up the idea of having an observer and originally that observer was a little girl. Then we did variations on that and we talked about maybe having a little girl who then gets older and older as time goes on and is a woman at the end of it. And then we learned that Rosa Parks was in fact involved with the Scottsboro Boys. That little moment in the last third of the show, where somebody brings them a cake, that was her, that really happened. So we immediately I think sort of grabbed onto the idea that yes she is Rosa Parks but she is also more than that, in other words she is a real person, but she is a symbolic person as well. I can even remember the sandwiches we ate as we planned that part of the show. We got our choice of tuna fish sandwiches or peanut butter and jelly, which I love. It was a very nice afternoon. JB: On a more general level about your career, what was it that drew you and Fred to such interesting, difficult chapters of history to write shows about? JK: I think your first adjective was the answer. What drew us to such “interesting” stories. The pieces that we've written which seem to be dealing with unlikely musical subjects, which are actually what make you want to write. I can't be I think more specific than that, but you know what's really hard to write? Boy meets girl, then they have an argument and they separate and then they come back together again. That's really hard, but if you're writing material about the beginnings of Nazism or the lack of justice in fascist South American prisons or racial problems, or killing people, murder in Chicago, those stories, those are rich pieces of material. It's much easier to write that. you become so engaged emotionally that your passion for writing the piece can maintain itself right straight up to opening night. 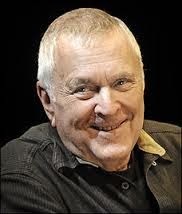 JB: John Kander, thank you very much for your time today. JK: It has been my pleasure. 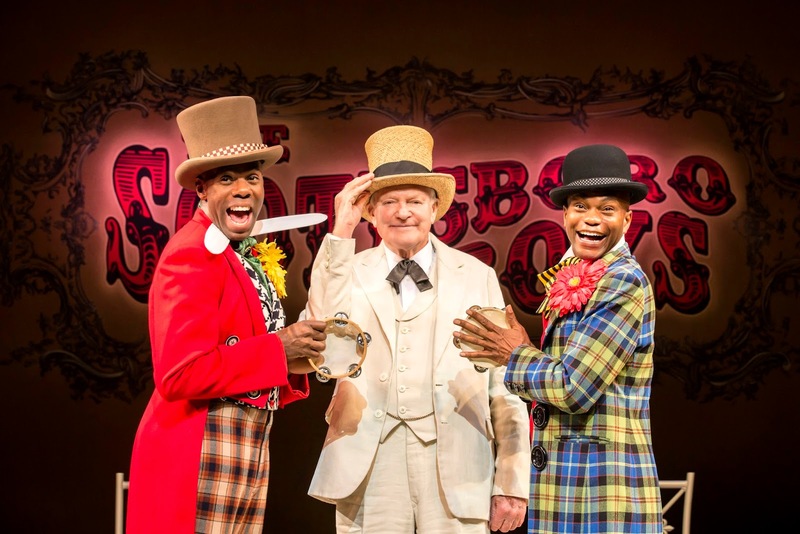 The Scottsboro Boys continues at the Garrick Theatre until 21st February 2015. My interview with Catherine Schreiber, producer and James T Lane, cast member of the Garrick production.